It’s easy to get carried away thinking about all of the wonderful upgrades you can make to increase the value of your home. But, if your goal is to actually walk away from your house with more money, then you need to play it smart and make sure you are only making cost-efficient upgrades. Shelling out several thousand dollars for a brand new tile roof may increase the amount a buyer is willing to pay for your home because it provides more long-term value. But you are selling your house now, so you need to make sure you are making your money back in the short-term. This is what I mean by being “cost-efficient.” If you want to maximize your profit, you need to be careful and selective when it comes to renovations. Only choose those that will increase your sale price by more than you are actually spending on them. So, without further ado, here are 5 cost-effective ways to increase your home’s value. Most people can expect to see a return on investment of about 60-120% for kitchen renovations. The kitchen is the center of most homes. It’s where the family eats, talks, and makes decisions. Not surprisingly, homes with renovated kitchens tend to demand more offers, sell faster, and sell for more money. Obviously a brand new kitchen is going to be pretty expensive. But, if you are not ready to put that kind of money into it, there are some minor changes you can make that can also improve the look and feel of any kitchen. Re-finishing or replacing cabinet doors, putting in some more modern lights, adding new appliances (even if you are planning to keep them), or even adding an island with bar stools can make your kitchen look and feel brand spankin’ new! 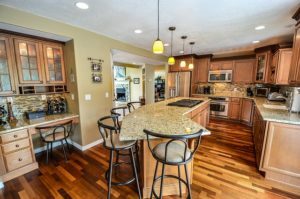 Some other relatively inexpensive upgrades to consider would be adding new tile to the backsplash, putting in a new floor, or adding LED accent lighting under the cabinets. These are just a few examples of upgrades you can make that are likely to improve your kitchen’s look and help you sell for a premium. Your return on investment for bathroom upgrades can be anywhere from 80-130%, depending on what kind of work you are doing. 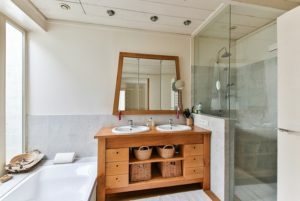 The number and quality of bathrooms are a top concern for most buyers, especially if those buyers are a family of 3 or more. When it comes to bathrooms, there is a pretty wide range in what it might cost depending on how much work you want to have done. For example adding a whole new bathroom to your home is going to run tens of thousands of dollars anywhere in Orange County. But simply adding a shower and converting a half-bathroom to a full-bathroom will cost considerably less, but will still significantly increase buyer demand, and thus, price for your home. Some less expensive options revolve around simply updating the bathrooms for maximum appeal. Simply installing a new vanity mirror, new toilet seat, replacing frosted glass, or even changing the tile in the shower can have a big impact on the perceived “luxuriousness” of your bathroom. Is the lighting in your house a bit dated? Old chandeliers, or flush-mount lights can make your home feel outdated. Try upgrading to some nice inset lights or hanging pendent lights to give your home a fresh modern look. 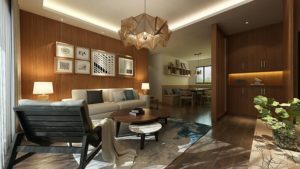 Interior lighting has a big affect on the “feeling” of your home. Even just increasing the wattage of the lights in your house can flood it with light and make spaces feel larger and warmer. These subtle affects can have a very real impact on how buyers feel about your home. The best part is, lighting is generally one of the less expensive home upgrades. New paint is one of the most cost-effective ways to increase your home’s value. Fresh paint can make the spaces in your house feel brighter, cleaner, and larger. Paint is one of the best cost-to-benefit ways to improve a buyer’s first impression. You may not see a dramatic dollar amount benefit, but the money invested won’t be huge either. If re-painting the interior of your home is a little too much for you, you can still see substantial improvement by just painting the trim. When the molding around the walls and doors in your home are showing signs of wear and tear, it can give buyers the impression that the whole house is in disrepair. Simply painting the molding in your home can give the opposite impression and make a world of difference. One of the often overlooked aspects of your home is landscaping. But landscaping is the number one way to improve the curb appeal of your home. Read: 3 great landscaping improvements to increase value. Having green grass, trimmed hedges, and an overall well manicured yard will help your home make a good first impression. You should also do your best to make sure the walkway and entry to your home are in great condition. Replace any cracked or broken bricks, paint or replace the front door, and make sure the doorbell, porch light, and door handle all look new and pristine. If you really want to step it up a notch, consider adding some accent lighting to your yard. Lighting up trees and bushes is a great way to make your home stand out at night, and with solar powered LED lights, it can be done for a very reasonable cost. 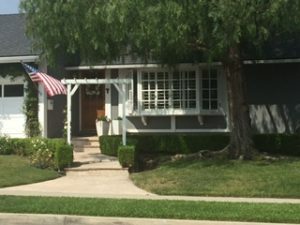 Posted in Real Estate, selling and tagged best home improvements for resale, exterior paint, get house ready to sell, home value, homeowner, how to get full value for my house, how to get most money for my house, how to sell my house, interior paint, kitchen renovation, landscaping, painting, renovating bathrooms, retunr on investment, sell house fast, sell house for more money, what home improvements add the most value, what's my home worth.